At Pipeshark, we offer technologically advanced repair services that can be applied to a variety of different situations in Pennsylvania. For pipes that contain small portions of damage and don’t need the entire pipeline to be relined, we offer point repairs specifically for this purpose. Sectional point repairs involve fixing a single point on a municipal pipe. Relining an entire pipe can be inefficient when just one part of the pipe has been compromised. Sectional point repairs are much more efficient than other types of repairs. Point repairs are recommended following our technicians conducting video camera inspection and leak detection services. We begin by diagnosing the actual problem. The cause of the symptoms noticed can best be seen by looking from the actual interior of the pipe. Pipeshark will deploy a sewer camera that can be remotely operated from the surface. The camera will travel the inner length of the pipeline, sending a 180-degree video feedback to the surface. Our experienced operator can pinpoint both the problem and its location within the pipeline. The findings and the corresponding solutions are then discussed with our client. 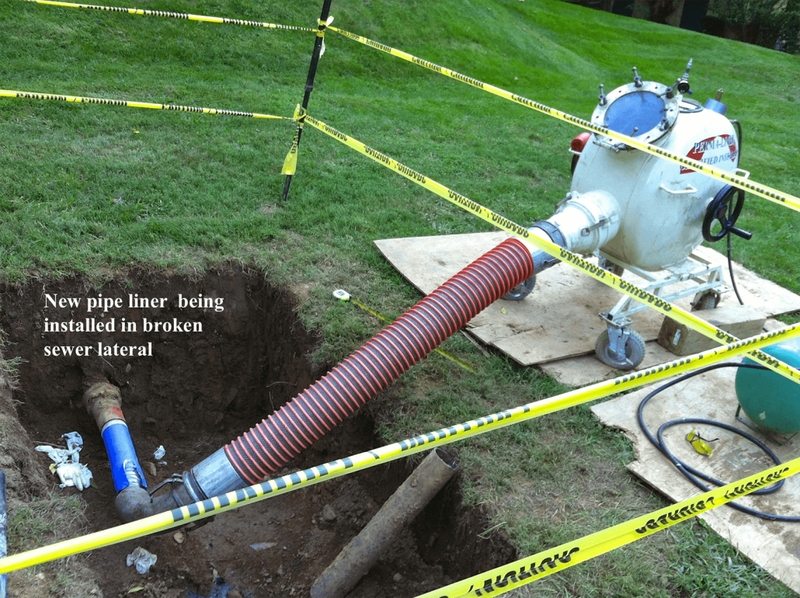 If our technicians identify portions of the pipe that are damaged, we will recommend pipe repairs. Prior to performing the repair, the cracked section of the pipe needs to be scrubbed to a smooth, resin-accepting surface. Pipeshark utilizes a method called hydro jetting to prepare the pipe. Hydro jetting uses high pressured water, a flexible hose, and a specialized rotating, water jetting nozzle to scrub the interior pipeline wall free of any debris that might prevent the repair from adhering to the pipe wall properly. Once the pipe wall is prepared, an inflatable liner coated with an epoxy resin is inserted and placed at the location of the crack. The sewer camera can then be inserted to confirm proper placement. After correct placement is confirmed, the liner is inflated, pressing the resin material against the pipe wall. After a short time of curing and hardening, measured in hours, the liner is deflated and removed. The sewer camera is again used to confirm the accuracy and completion of the repair. Sectional pipe repairs require no digging up of sidewalks, parking lots, or landscaping. This form of repair can be performed with very minimal impact on business flow or homeowner daily routines. There is no repairing of surface hardscapes or treasured gardens after the repair has been completed. All of our repair work is conducted completely underground. Since every sewer line will require a unique sectional point repair, the kit can usually be customized for that particular project. The point repair is attached to a specialized bladder, and the bladder is placed over the damaged part of the host pipe. The bladder is inflated and set in place, and during this time the resin on the outside of the bladder is cured. Prior to the installation process, the entire pipe is thoroughly cleaned, which helps to eliminate obstructions and helps the resin to adhere to the existing pipe. Sectional pipe repairs can be customized to all client types and the regulations and requirements specific to their particular property. Sectional point repairs are thorough, time efficient, and cost effective. This process can be used on pipes ranging to 50 inches in diameter. Up to 30 foot lengths can be repaired at a time, if necessary. The result is waterproof and seamless, and often stronger than the original pipe material. Pipeshark serves the eastern Pennsylvania area but we have traveled to Washington, D. C. and Montana to complete projects. Our dedicated and experienced staff is looking forward to helping you with your trenchless sewer repair requirements. To learn more about sectional point repairs and how they may work for your next repair project. Our Pipeshark team is extremely experienced with sectional pipeline point repairs and offers these services for maintenance, pre-purchase information, and troubled pipeline diagnosis in houses, condos, and apartment complexes across Pennsylvania. Our experience also extends to working on projects with engineers, municipalities, and governmental agencies while maintaining the standard code and regulations. Call our staff of experts to schedule a consultation and learn more about how we can help you. Pipeshark serves the Harrisburg, Hershey, Lower Merion, Lancaster, Devon, Paoli, West Chester, Berwyn, and Wayne, Pennsylvania areas. We have also traveled as far as Washington D.C. to support specialty project teams.